The City of Summerville encompasses streets that are maintained by the City and Georgia Department of Transportation (GDOT). It also has smaller, private roads/streets. While the City strives to maintain its roads to the highest standards possible, it is not legally permissible for the City to maintain privately owned roads or GDOT roads with City personnel and equipment. If you have a street issue that you would like to report, please contact the Public Works Department at (706) 859-0907 and we will help you determine if it is a City maintained street or help point you in the right direction. If you notice a problem with a sidewalk in City of Summerville, please contact our office and the maintenance staff will investigate the problem as soon as possible. If you are experiencing a problem with a street light (i.e. street light not on at night, street light on during the day, street light going off and on, etc.) you may address it one of two ways. You may contact Georgia Power directly to report the problem or you may contact the Public Works & Utilities at (706) 859-0907. Either way, if at all possible, try to obtain the Pole ID number first to better process your complaint. If you cannot obtain a pole number, please be prepared to provide a detailed description of the pole location. Streets are swept using a schedule. 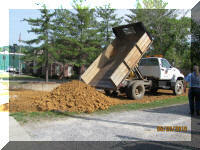 If your street needs immediate attention, please contact our division and we will try to accommodate your request. Please contact the Public Works Office if you see a street sign down or missing. As we patrol our streets on a daily basis looking for missing signs, occasionally we miss them. The citizens are a big help in letting us know where we are missing signs or if one has been knocked down. The brush/debris is on the edge of the street in a manner that the crews won’t have to come on private property. There is not a mixture of any other materials in the brush/debris, i.e. fence, old lumber, junk, etc. 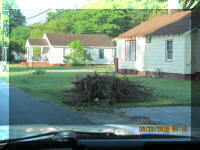 The home owner or tenant cut the brush/debris themselves and a private contractor did not. There is no hazardous materials involved. If you are unable to reach the Public Works & Utilities, please call City Hall at (706) 859-0900 and an employee will be dispatched to you.